Have questions about the $99 Social Reseller program? Search for your answer below. Do you offer any kind of white-label or reseller program? We sure do! And it’s incredibly easy to get started. 1. Fill out and submit a simple application form, making sure to read and agree to the Reseller Agreement. 2. An Account Manager will reach out to you soon after, usually within 24 hours. Be sure to ask any questions you have about getting started. 3. Add our social media services to your current offerings and begin marketing to your current and prospective clients. Set a price that is comfortable to you, keeping in mind what your market will bear. Here’s more information on our Reseller Program. White label means that we don’t brand anything you sell with our logo or company name. In fact, unless you tell them, your clients will never know that $99 Social had anything to do with managing their social media accounts. 18 people found this faq useful. What is the cost to become a $99 Social reseller? 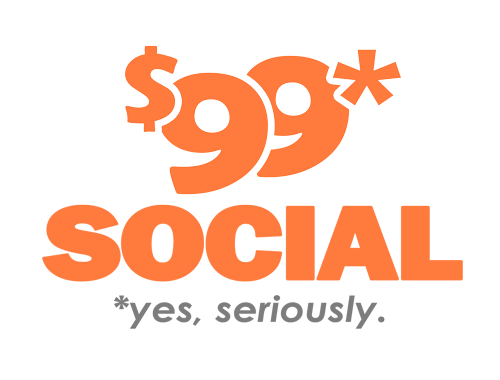 Our pricing starts at $99 per month to become a $99 Social Reseller. This includes access to our white labeled posting platform, access to our reseller dashboard and much more. We think it’s a great idea for you to also have a $99 Social account for your own business, but it isn’t required. Do you have a Reseller Agreement I need to agree to when I become a Reseller? Are there minimums or quotas I have to meet to be a Reseller? No, there are not. No minimums, no quotas, no kidding! Is there a wholesale rate for the white label program? Because our price is already so low, we do not offer a discounted rate for Resellers. As a Reseller, how much can I charge for Social Media services I sell to my clients? The short answer is: you can charge whatever you want. We don’t limit you from charging whatever your market will bear. That said, do some research online to determine what people are paying for similar services. You’ll probably be shocked – and excited! You won’t find the quality and service we offer at a lower price anywhere. As a Reseller, will I have a point of contact? Someone who can help me get new clients on board and answer my questions? Yes! Depending on the reseller plan you choose, you get 7 days per week access to our support team. For the Deluxe and Agency plans, you’ll have a dedicated Account Manager who is here to be of assistance to you and answer any questions you have. Under your Reseller Program, what if my client has a question about their account? How is this handled? As a Reseller for $99 Social, you are the client-facing part of the relationship. So if your client has a question, they’ll ask you, and you’ll ask us (our support team or your dedicated Account Manager), if it isn’t something you have the answer to. Complete the form below and we'll be in touch to answer your questions. I have questions about your services and am not yet a client. I am an existing client and need support. I have questions about your Reseller Program.